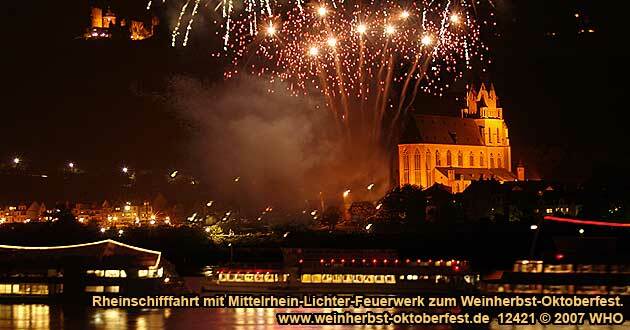 German wine festivals: Golden wine autumn and Swimming Federweisser festival with boat cruise on the Rhine River and firework "Rhine River Lights"
Discover the romantic Middle Rhine River in Germany from a completely new point of view with half day boat cruises. In the middle of the romantic Middle Rhine River valley which was declared World Heritage Site in 2002, natives and tourists will celebrate the "Golden wine autumn" on two Saturdays in October. With Federweisser (new wine), red wine and white wine from the Middle Rhine River, nonalcoholic drinks and an abundant food offer for the well-being is taken care in the best way. 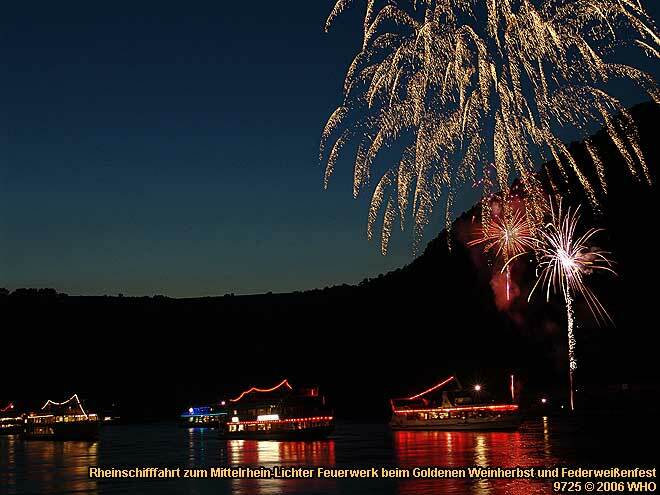 During the time of the "Golden wine autumn", there will start round cruise boats with DJ music and dance from the area around Bingen, Rudesheim, Assmannshausen, Kaub and Bacharach, from the area around Coblence, Lahnstein, Rhens and Braubach as well as from the area around Boppard, Kamp-Bornhofen, St. Goar, St. Goarshausen and Oberwesel in a wine town. 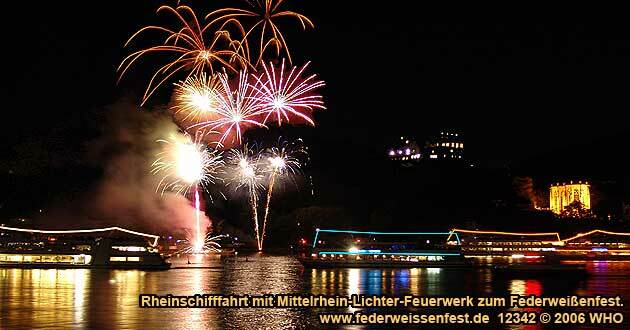 During the round boat cruise on the Rhine River, the boat passengers celebrate the the Swimming Federweisser vintage festival with Federweisser (new wine) and onion tarts on board. 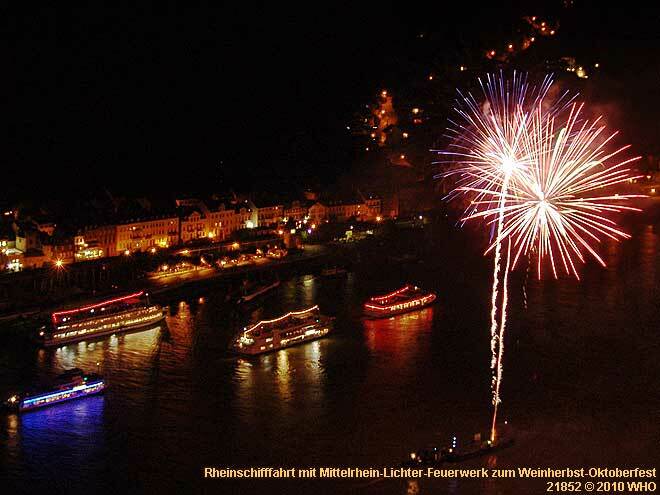 The highlight of the event is a large firework display of the event series "Rhine River Lights", which will illuminate the nightly sky over the Rhine River in the most beautiful and different colors. The firework will be burned down between Lorelei Rock and Rhinegau by Pyrotechnics Stockmann. The passengers will have the possibility to watch the firework display from the open air deck of their boats virtually from the "front row", before the boats with DJ music and dancing will head back to the places of departure.